Ohio redshirt junior running back A.J. Ouellette (#45) breaks downfield during the second half of the Bobcats’ 42-30 win over Kansas on Saturday. A.J. Ouellette and Dorian Brown just needed to find the holes. And then they needed to burst through them. Finding gaps against Massachusetts on Saturday wasn’t difficult, though. Ohio’s offensive line obliterated UMass’, and because of that, the team’s running game continued to thrive. Ouellette and Brown combined for 197 rushing yards and three rushing touchdowns during the Bobcats’ 58-50 win on the road over the Minutemen. The ease with which the Bobcats gained rushing yards was remarkable. “It’s just reassuring that no matter who’s in there at running back you know is going to get the job done,” Ouellette said of Brown’s performance. 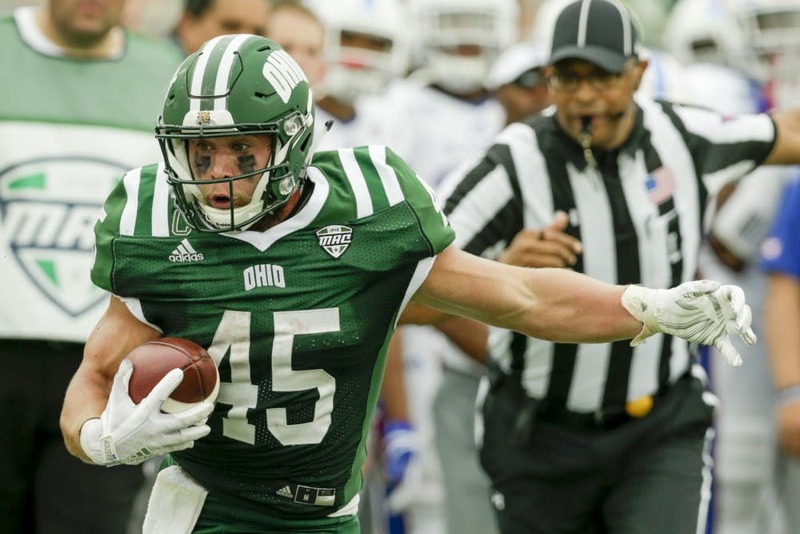 Ouellette’s praise of Brown could be extended to other agile Bobcats. For the second time this season – the first being against Hampton – Ohio rushed for 200 or more yards. The Bobcats’ 292 rushing yards against the Minutemen were a season-high. For a third straight game, Ouellette rushed for 100 or more yards; Brown rushed for 72 yards and two touchdowns; quarterback Nathan Rourke rushed for a season-high 113 yards and two touchdowns. And all averaged at least five or more yards per carry. Through five games, the Bobcats boast the best running game in the Mid-American Conference. “If you look at some of those plays, (the) ball carrier really isn’t touched until 10 yards down the field, which is just a testament of our (offensive line),” Rourke said. Ouellette and Brown benefited from the offensive line, but Rourke benefited from the duo’s success. The Minutemen were focused on containing Ouellette and Brown, so Rourke had opportunities to slip through the defense for solid gains. It was the first time Rourke rushed for more than 100 yards this season. With Rourke’s running abilities, the Bobcats’ offense is capable of being multi-dimensional. The running backs aren’t the only players capable of gaining yards after contact. And then once the Bobcats’ running game is established, a passing attack is opened – and then the Bobcats can continue to run, too. That is how the Bobcats’ offense was supposed to be set up last season. With Ouellette, Brown and Maleek Irons, the Bobcats had solid depth at running back. And with solid depth at running back, whoever played quarterback simply had to get the ball to the unit’s playmakers. But Ouellette suffered a season-ending injury and Brown and Irons struggled with injuries throughout the season, too. Now, Ouellette and Brown are healthy, though. Ouellette is the top-ranked back in the MAC. Brown is like Ouellette in his style – he’s powerful, yet explosive. Add in shifty freshman running back Julian Ross, who has three touchdowns this season, and the Bobcats are set for success. The holes for the Bobcats to run through are still there. And all they have to do is burst through them.